While Paperial.com may not be a service you have heard of, they exist and they are on the market, offering academic assistance of all kinds to students who are in desperate need of it. 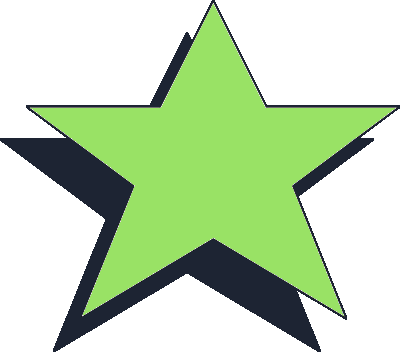 Their website seems interesting and different, more targeted towards the younger audience, which has its appeal. However, it seems slightly less professional than others, taking into consideration that this is a service that’s in charge of your academic success, to a certain degree. Let’s look at some of their other features, and what kind of advantages or disadvantages come with ordering a paper from their service. We were immediately confused by quite an extensive list of services that they offer. Immediately we wanted to find more information on their writers to see how possible it is for them to offer a great service, high-quality papers in so many different fields and on various academic levels. They would have to have a true army of professional writers. And as you may assume, we weren’t able to find much information about the writers, which kind of made this situation a little bit more suspicious. Their list of services include more than two dozens of different assignments they can write, and that’s not taking into consideration different fields and subjects. They offer the usual kind of writing, essays, dissertation, research paper, editing, and when you take a closer look at the list you can see a lot of the services listed are just repeated and paraphrased. For example, they will offer a do my essay service along with essay writing, which is basically the same thing. 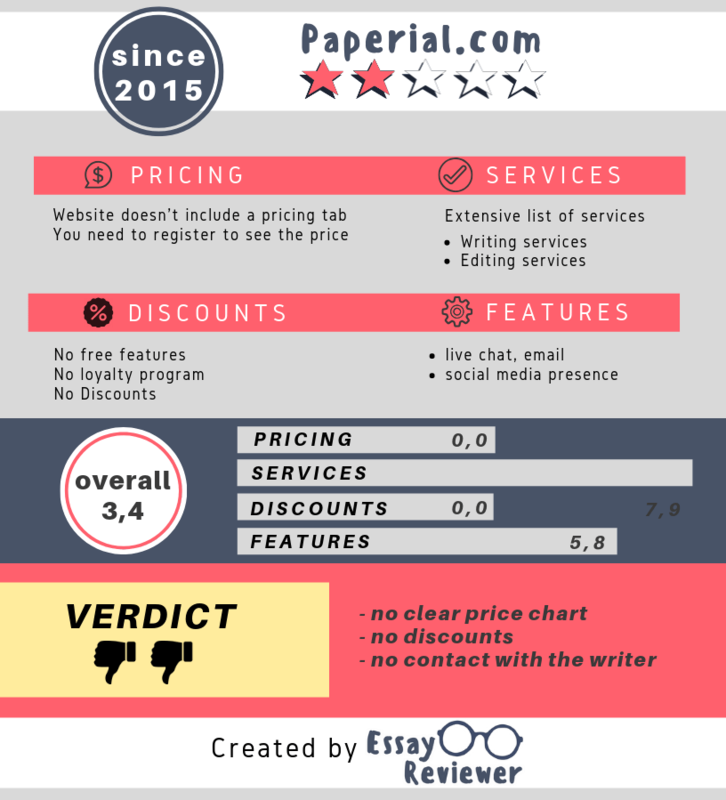 It was beyond disappointing to see that the Paperial.com home page didn’t include a pricing tab. This is one of the crucial factors that all students consider before placing an order. If you don’t know the price, and you can’t find it, chances are you are going to move on. While there is always the option to reach out to customer support, it does take some time out of your day to do so. As you might have assumed by the pricing part of this Paperial.com review, there are also no discounts listed. We reached out to their customer support simply to ask whether they offer any kind of discounts. We never received a response which we thought was really rude. DID WE GET A GOOD PAPER? In order to be real about Paperial, we decided to order an essay. We gathered a lot of information to provide so that we didn’t have to waste a lot of time on the ordering process. However, it was quite an extensive process, that took a lot of time. There was some information that we didn’t see why it was there to fill out, but we still did. Afterward, we were told we were going to speak with the writer, but we waited for 2 days and that never actually happened. We received the essay all of a sudden, finished and delivered without ever speaking to anyone during or before the process. This, right off the bat wasn’t okay. Then, when we read the essay, there were a couple of formatting issues present. For example, some headlines and paragraphs were stuck together and the ideas weren’t organized so that the essay flows beautifully. In fact, it didn’t seem like they took much time to read our instructions or to even read through the essay to correct their own mistakes. Many Paperial reviews complained about their customer support, but the level of disappointment is on an entirely whole level. We decided to reach out to customer support because we were extremely disappointed with the paper. The first time we reached out, we didn’t get a response at all. The representative kindly asked us to wait, but we never got a response. The second time we reached out, we got the same response. It seemed as if they were avoiding giving us an answer. This is definitely not how professional customer support should act, especially not towards a customer who has already paid for a paper. Not to mention an unhappy customer that could influence their reputation. The final verdict on this writing company will be a bad one. They are overall a very bad writing company that doesn’t keep their promises, overcharges for their papers and doesn’t offer any quality at all. We would recommend that you can keep on searching for a more respectable, honest service that is actually going to care about providing you the assistance that you need. Paper originally show plagiarism and was revised. Still showed plagiarism, about 60% was similar to another students work and they stated they needed more money to fix it. Really upset with the company. I will not use again. Impossible to get a refund. Comment: 07/21/17- This task was not evaluated for content, but instead was scored as unsatisfactory due to originality concerns. Revision is necessary, as 58% of this task is unoriginal material. This is a violation of the Academic Authenticity Policy as all assessments and projects must be your own work. Directly quoting another person’s work or ideas—or closely paraphrasing another’s work or ideas—requires acknowledgement of that source in the form of in-text citation and reference list inclusion. Please note that upon resubmission, the evaluation scores and comments from previous submissions will not be taken into consideration when evaluating. However, the number of submission attempts will not reset. We encourage you to contact the Academic Authenticity Support Specialists at XXXXXX before resubmitting. I cannot resubmit and currently on probation because of this. The actual quality of the papers is not great, you would have to constantly heck grammar, content, spelling, formatting, etc. They do not have native English writers and so the work produced is basic even though you pay a premium for a PhD level service.